Excelling in Innovation, Design and Engineering! GFCI and Daisy Chain Capability - Connect 5 Units! The new low profile machine is a radial air mover with outstanding performance, 1100 CFM and 2.1 amps, as well as many superior features, including its exceptional ergonomics and compact size. WIth daisy chain capabalities, connect 5 units to one outlet. Stack up to 6 units for easy storage! 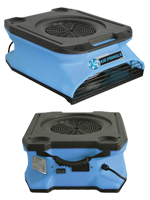 Download the Air Pringle Air Mover Sell Sheet to learn more. NEW AND IMPROVED Corsair Air Mover with Daisy Chain Capabilities! We have recently upgraded the features on our Corsair Air Mover. We have added (2) GFCI outlets so that you can now connect multiple units to a single outlet! Connect (5) units on a 50 Amp circuit at high speed and connect (7) units on a 20 Amp Circuit at low speed! 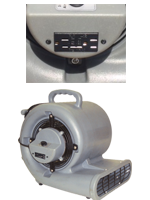 (2.2 Amps Low Speed / 2.4 Amps Medium Speed / 2.7 Amps High Speed) Click on the Sell Sheet to learn more!